My Fairy Garden is the first of its kind: a toy that’s also a real, live garden! Children love kits that allow them to grow plants at home; it gives them a connection to nature and a sense of satisfaction at having nurtured a living thing. My Fairy Garden takes it to a new, exciting level by allowing children to interact with it as part of an enchanting play set! Children plant the quick-germinating seeds, and care for their garden, all while setting up and playing with adorable fairies, woodland friends and accessories! It’s a great collectible line for children ages 4 and up! A charming toadstool house sits beside a sparkly rocky cave for magical fairy fun! It’s the first fairy garden to include a shiny rainbow and glittery unicorn, a much-loved theme! Plant all around the house and cave, and even atop the rocky area to create beautiful garden areas. 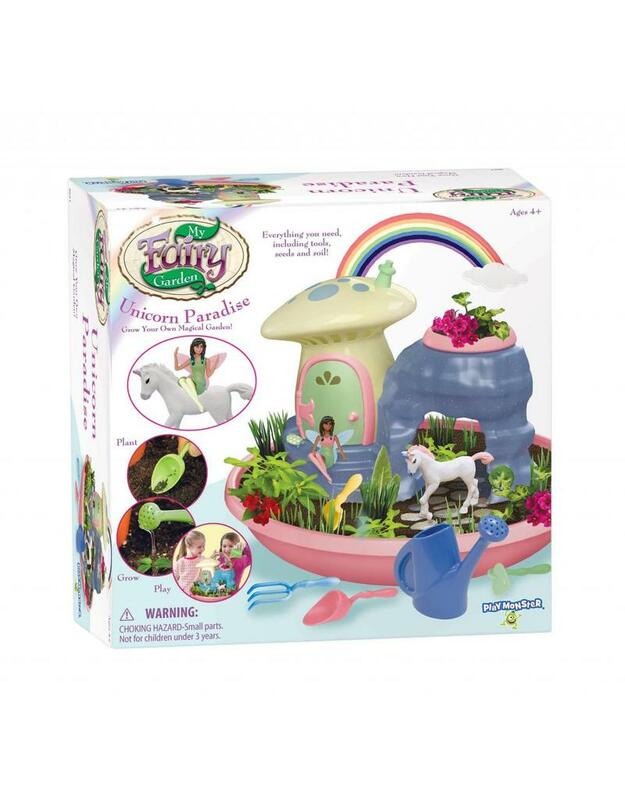 Then, play in your new fairy land with Dahlia the fairy, Pebbles the turtle and Celeste the Unicorn! Seeds and soil included.